Various stalk rot diseases have been confirmed in samples from corn fields across Nebraska. Stalk rot diseases and the pathogens that cause them are common in corn fields. They can weaken corn stalks leading to stalk lodging, breakage (Figure 1), and harvest difficulties for producers. They can also impact yield if they prematurely kill corn plants. Ears lost due to lodged corn may also create volunteer corn issues during the following year(s). It’s important to be aware of stalk rot incidence in fields to better understand the risk they create for harvest difficulties if plants lodge. In addition, knowing which diseases are present in fields can help producers anticipate, prevent, and manage them in subsequent growing years. Unfortunately, the symptoms that stalk rotting pathogens cause can be misleading and make it difficult to diagnose. 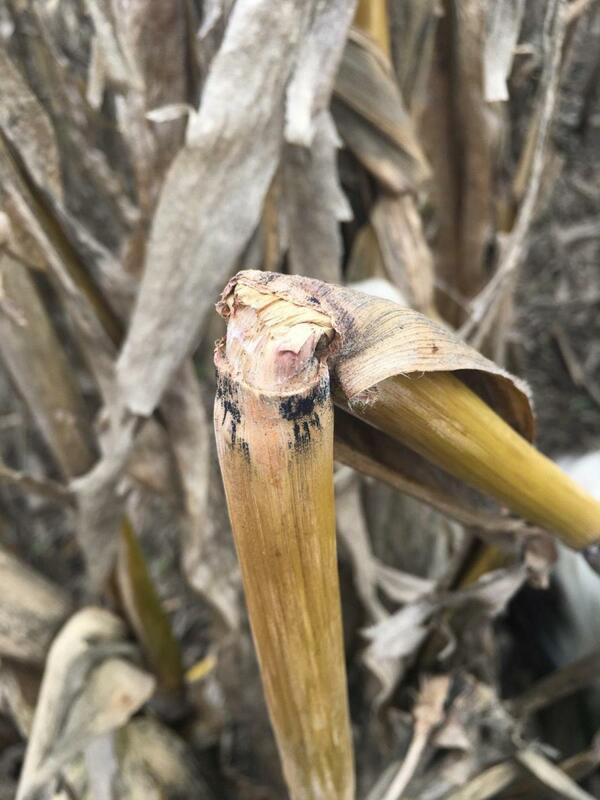 For example, some of the earliest symptoms of stalk rot disease may be the discoloration of leaves and rapid plant wilting and/or premature death. 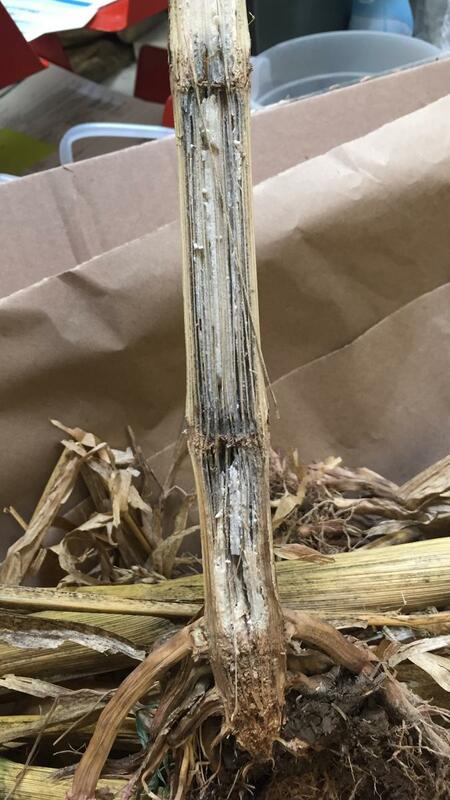 In recent weeks, corn samples with stalk rot diseases have been submitted to the UNL Plant and Pest Diagnostic Clinic and have been confirmed elsewhere across Nebraska and other states. On this Market Journal segment Tamra Jackson-Ziems demonstrates how to test for stalk rot and discusses why it's important for this year's harvest and next year's seed selection. Proper management starts with a proper diagnosis. Submitting entire plants is the best way to get an accurate diagnosis. Walking through the field, randomly select a minimum of 100 plants representing a large portion of the field. To test for stalk rot you can PUSH the plant tops away from you approximately 30 degrees from vertical. If plants don’t snap back to vertical when released, the stalk may have been compromised by stalk rot disease. An alternative method is to PINCH the internodes of the lower stalk. 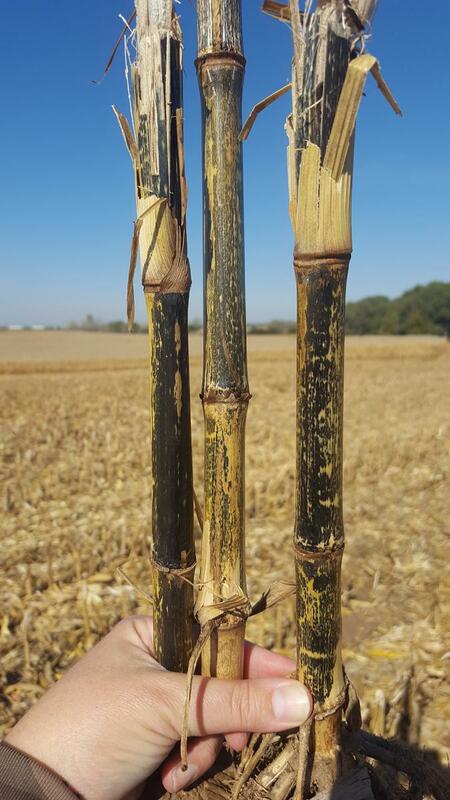 If the stalks crush easily by hand, their integrity has been reduced by stalk rot and they are prone to lodging. If more than 10% of plants exhibit stalk rot symptoms, then harvesting that field first should be a priority over others at less risk in order to reduce the chance of plant lodging prior to harvest. The inside of infected stalks will appear discolored and possibly more hollow as the spongy white pith rots away, leaving the strands of loose vascular bundles. Fusarium stalk rot is especially common during damp conditions, but may occur anywhere. One of the most common symptoms is the development of crown rot inside the lower stalk, below the soil line, near where roots attach to the stalk. The pathogen, Fusarium verticillioides, can sometimes be visible as white fungal growth on the outside of stalk nodes. Eventually, the disease may cause discoloration of the inside of stalks to light pink or salmon (Figure 2). Gibberella stalk rot is also a common disease in Nebraska, caused by Fusarium graminearum (syn. Gibberella zeae). Pink to red discoloration inside the stalk is a common symptom of the disease that may also be accompanied by tiny black fungal structures (Figure 3) on the surface of the stalk and may be scratched off. This and other stalk rot diseases also may lead to weakening and breakage of stalks at nodes (Figure 4). Figure 3. Red to pink discoloration inside stalks caused by Gibberella stalk rot may be accompanied by the growth of black fungal structures on the outside of the stalk. (Photo by Terra Hartman). Figure 5. Anthracnose stalk rot commonly causes development of black lesions visible on the surface of the stalk. Anthracnose stalk rot can cause a leaf disease and is a common cause of top rot in corn. In more advanced stages the disease can cause the development of black lesions visible on the outside of the stalk (Figure 5) and is caused by the fungus Colletotrichum graminicola. Charcoal rot is one of the few diseases that are more common during drought conditions, and so, is more likely to affect corn in non-irrigated fields or pivot corners. The disease is characterized by the presence of many tiny black, round structures inside the stalk that can give it a gray to black appearance, like charcoal dust (Figure 6). In addition, the fungus that causes charcoal rot, Macrophomina phaseolina, has a wide host range and can cause the same disease and symptoms in several crops, including corn, soybean, sorghum, and alfalfa. As you continue to scout fields late in the season, it is important to collect the right kind of sample to ensure proper diagnosis. Over the course of several days, the leaves from plants with stalk rots can change quickly and may become necrotic with symptoms resembling sunscald or discolored to pale green. Splitting the stalks and crowns of these plants may reveal discoloration and decay which can limit water movement up the plant, leading to decline and death of the plant and its leaves. Some stalk rots can be managed through the selection of resistant hybrids. Some cultural practices that lessen plant stress ― balanced fertility, proper planting populations, and insect control, also may reduce the incidence of stalk rot diseases. Even though the noticeable symptoms appear on the leaves, the pathogen is not present in the leaves. Additionally, it may be easier to cut the plant a few inches above ground level and leave the crown and roots, but the main difference between crown and stalk rots is where the pathogen infected. If the crown and roots are left and the disease has not progressed up the stalk, it is difficult to get an accurate diagnosis. Submitting entire plants is the best way to get an accurate diagnosis. Proper management starts with a proper diagnosis. Please do not send dead plants. It is difficult to ID the exact cause of death on a plant once other, opportunistic pathogens and microorganisms have had a chance to infect the weakened plant. Ideal samples are ones that are just starting to show symptoms. Keeping soil on the root ball is helpful in keeping the plant alive a little longer as we work through our diagnosis. Please enclose the root ball in a separate plastic bag to prevent soil from spreading to the rest of the plant. In order to fit the entire plant into a bag or shipping container it is fine to cut, or bend them to fit into a trash bag or large ziplock bag. For more information see How to Submit Crop and Pest Samples. As always, please fill out the sample ID submission form with as much information as possible. There is nothing to be done at this point in the season to stop stalk rots as affected stalks will continue to degrade over time, further weakening them. But, you can work to minimize your losses by identifying which fields have the worst stalk rot diseases and adjust the harvest order of those fields in hopes of harvesting them before significant lodging occurs. 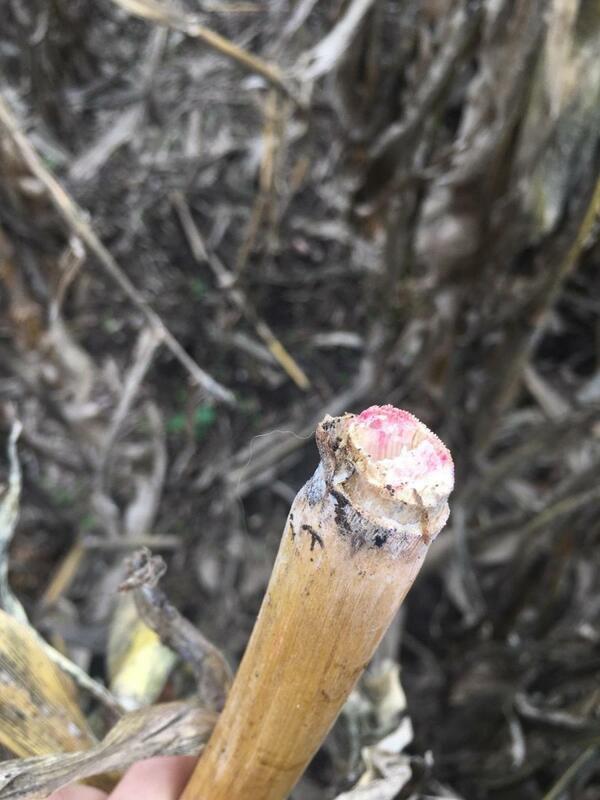 Consider harvesting or chopping those fields that are heavily impacted by stalk rots first or earlier to minimize losses that can occur after lodging. Some seed companies provide ratings for their hybrids’ reactions to a few stalk rot diseases. This may be helpful in selecting hybrids for fields with chronic stalk rot disease. For more information on stalk rot diseases of corn, see past episodes of Market Journal and UNL Extension publications: Corn Disease Profiles II: Stalk Rot Diseases or the more detailed publication, Common Stalk Rot Diseases of Corn. If you are in doubt about the identity of a disease or cause of another plant problem, you can submit a sample to the UNL Plant and Pest Diagnostic Clinic (P&PDC) for diagnosis. For more information about these and other plant diseases visit the Plant Disease Management section of CropWatch. For submission forms for the P&PDC and submission instructions, visit the P&PDC section in CropWatch.